All the children at Highclare Preparatory School have enjoyed taking part in a varied programme of activities during British Science Week. The week began with assembly presentations and the launch of a poster competition based on the theme of journeys. Pre –Prep children enjoyed learning about the ‘journey’ of the Hungry Caterpillar and how he made good food choices to help him grow and eventually turn into a butterfly. Junior pupils were interested to learn about electric cars in a talk presented by Mr Stuart Griffiths. Mr Griffiths explained the choices of electric car types that are currently available and told the children about the developments in autonomous car engineering and design. We were also pleased to welcome Professor Frank Eperjesi into school, Professor Eperjesi presented an interesting talk to the junior pupils about careers in STEM subjects and lifelong learning opportunities. J5 pupils thoroughly enjoyed a workshop by RPS Engineering, where they learnt about the work of civil engineers. They learnt about the management of waste water and about the construction of the new Thames Tideway Tunnel. The children were interested to learn that the spoils from the construction of this tunnel are taken away by barge. 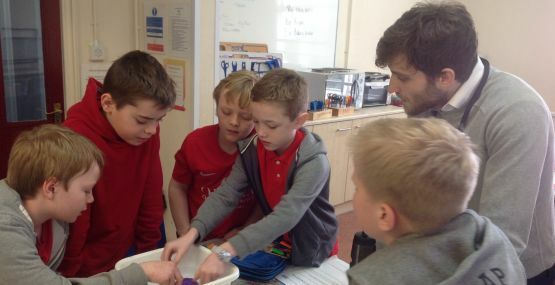 This led them to investigate boat design, with the challenge of constructing a Plasticine boat and finding out the maximum weight it could carry. What a fantastic week nurturing a life long love of science in pupils.